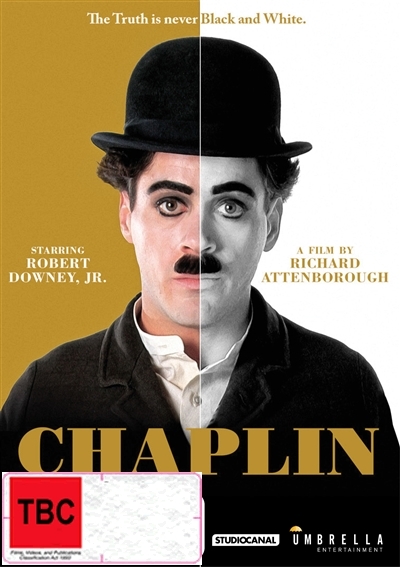 Robert Downey Jr captures the essence of comic genius Charlie Chaplin in a compelling, nuanced performance that earned him Oscar and Golden Globe nominations for Best Actor. Director Richard Attenborough's well-crafted portrait traces Chaplin's impoverished London upbringing, ext... read full description below. Robert Downey Jr captures the essence of comic genius Charlie Chaplin in a compelling, nuanced performance that earned him Oscar and Golden Globe nominations for Best Actor. Director Richard Attenborough's well-crafted portrait traces Chaplin's impoverished London upbringing, extraordinary success as an actor and director, his troubled marriages, scandalous affairs, shocking exile to Switzerland and his triumphant return to Hollywood. The huge star-studded cast includes KEVIN KLINE, DAN AKROYD, MILLA JOVOVICH, DIANE LANE and GERALDINE CHAPLIN (as her own grandmother), and Downey's astonishing mimicry of Chaplin's gait, gestures and accents complete a dazzlingly authentic portrait of one of cinema's first pop culture icons.